When one has celebrities in his family, that person does not like to talk about them. I find it tacky to brag about my famous relatives because they're really just regular people who happen to be well-known. But the more I think about it, the more I realize there is no harm in trumpeting one's celebrity relatives if they're deserving of recognition. Therefore, I want to say I am proud of my brother, Michael Scott, who got engaged to his cool and stylish girlfriend Judi this past weekend. Technically, my brother's name is Fred Stevens, but he has developed a genius brand of humor reminiscent of "The Office" boss, Michael Scott. During his stay in Southern California, his life has been filled with quirks, madness and romance. Just like Michael Scott, he spreads love to all those he meets with a dash of cornball and puns. During his visit to California, I have witnessed a successful mix of quips and obvious puns. After a trip to the Long Beach Aquarium of the Pacific, I particularly enjoyed his exchange with a parking attendant in which he explained how happy the fish were to see him. That rip-roaring visit to the aquarium was exceptionally hilarious. Two of my favorite moments displaying my brother's humor were when he heckled sea otters and had approximately six people take various photos of him and Judi. I also enjoyed how he somehow used my mother's aquarium pass with her photo on it for admittance. When I heard that he proposed to Judi in Big Sur, I was extremely happy for the duo. Marriage can be beautiful. However, it can be hard. 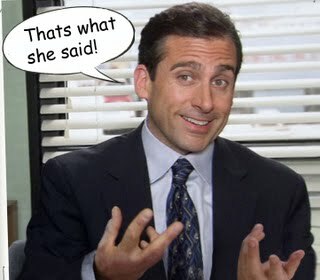 That's what she said. An imρressive ѕharе! ӏ've just forwarded this onto a friend who was doing a little homework on this. And he in fact ordered me lunch because I found it for him... lol. So let me reword this.... Thanks for the meal!! But yeah, thanks for spending time to discuss this subject here on your web page.